Good news,the Clannad concert is still fresh in my memory and there's another chance to see Moya.She will perform on March 11 at the Pavillion Theatre in Dun Laoghaire as part of Seachtain na Gaeilge. A week later would be better for me . I will be in Dublin from 16 to 20 March. Dubhy, I assume from the way that post is phrased that you're going - so I'll see you there!!! Susann,I only realised when I read your post that the concert will take place on the Friday before St.Patrick's Day.Old age must be kicking in ! Dave,you're right,I have got my ticket for the night.The Pavillion Theatre is only around the corner from the DART and bus stations,really easy to get to . I was tempted to go to St Paddy's again, but decided that a Moya concert was too good to pass on - and even by my standards, two trips in the space of a week is a bit much! I assume you're going to the St Paddy's Festival and Parade, Susann - have a great time! Do you a favor...move to Dublin ! Im surprise that Moya never tour Ireland. A gig here and there yes but never a tour. Id love to see Ireland and i will if there is some gigs to see...and warm weather ! No more Canadian winter in Poland ! This is what the people use to tell me in Poland "Hey Pierre you brought the Canadian winter with you ?" Since then Poland's weather has been pretty mild i believe. I think april in Netherland will be fun. Warm weather and longer day. I cant wait. ill be in the country from april 6th to the 18th. From the start to the end of Moya's tour. But dont worry i wont see all the concerts... just 5 ! Have a great time Pierre! I purchase my plane tx yesterday. Got an amazing deal. Could be the effect of a good Canadian buck ! Right after i purchase the ticket i said to myself "is this for real this time ?" Ive got two trips to Amsterdam cancelled so far; the infamous volcano last year and a scare at the doc office 2 years ago. Keep my fingers crossed ! Last night was another to remember,a few of the forum gang attended the concert in Dún Laoghaire.Moya and her friends played many familiar songs and tunes,there were also familiar faces on stage like Sinead and Cormac. 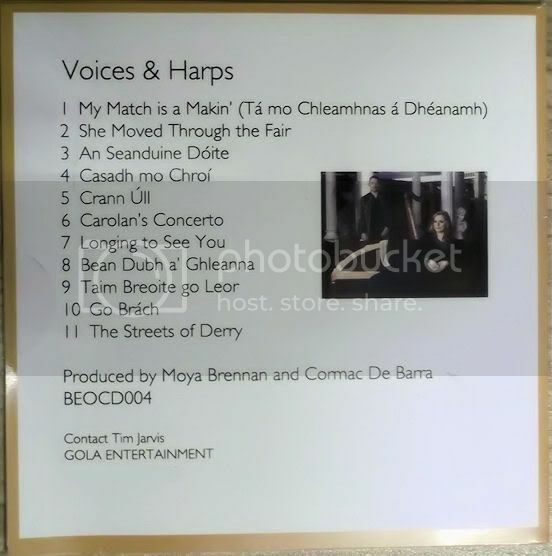 We also got our hands on a limited edition CD called Voices and Harps,only 100 were made of this version.The remixed and complete version will be released later this year,another thing to look forward to. There are also a few videos on the way,hopefully they will be up soon. Looking forward to seeing the rest. Thanks for all your help last night, too. The photo in your profile looks very familiar Dave,where was it taken ? Thanks for posting your beautiful pictures, Dubhy! it must have been a great night! I am very interested in the new album you mentioned, Voices and Harps. I had not heard of it before. Can you tell me more about it (or someone else who has it)? Which tracks are on it and what's it like? I would love to hear it, but I guess I will have to be patient for a while . Do you know when the album will be released? Dubhy63 wrote: The photo in your profile looks very familiar Dave,where was it taken ? Not sure....this Dutch/Irish guy turned up the other night and offered to take it - and I have to say I love this pic!!! (Seriously, though, it is a lovely photo, thanks for taking it!). @Yvonne - Voices and Harps is pretty much a remastered version of My Match is a-Makin', so the track list is almost the same (to paraphrase Cormac and Tim "It's the same as My Match....but sounds better!" ). The only tracks that don't seem to be on My Match.... are Casadh mo Chroí and Go Brách. For me, though, it's more the fact that it's a limited edition that makes it so special (and both Moya and Cormac signed our copies, to make them that bit more special, too!). It's not impossible that Moya will have some copies left for when she goes to the Netherlands, though, so it's worth checking the merchandise (but it's always worth doing that, anyway!!!! ) at the gig. Dab051176 wrote: Not sure....this Dutch/Irish guy turned up the other night and offered to take it - and I have to say I love this pic!!! (Seriously, though, it is a lovely photo, thanks for taking it!). Dave,weren't you the Dutch guy on the night ? Yes, I'm sending my passport off to be exchanged as we speak!!! !